Borax is a common household item that is primarily used as an effective cleaning additive. This natural alkaline mineral can do everything from disinfecting to whitening to killing insects to fighting mold and mildew. The only thing this popular powder can't do is motivate you to clean your house during your downtime, but if you do muster the energy to deep clean and get your Marie Kondo on, take a look at your products and see if borax is a common ingredient in your favorite household cleaners. Borax is a natural mineral also known as sodium borate, sodium tetraborate or disodium tetraborate. Borax naturally forms in deposits through the repeated evaporation process in seasonal lakes. Some commercially created deposits are found in areas such as California, Turkey, the Atacama desert in Chile and the southwestern United States. Newly formed deposits are also in areas such as Bolivia, Tibet and Romania. Sodium borate is a soft, white crystal that can be dissolved in water and is used in some of the most popular cleaning and laundry products as well as in dishwasher detergent. Although consumers mainly know borax for its cleaning properties, it is also found in items such as toothpaste, cosmetics, slime-making kits, flame retardants, enamel glazes, glass, ceramic and pottery. You can use borax for many different things. You can use Borax to get rid of common household stains, mold and mildew. You can use it to get rid of insects inside and outside of the home. 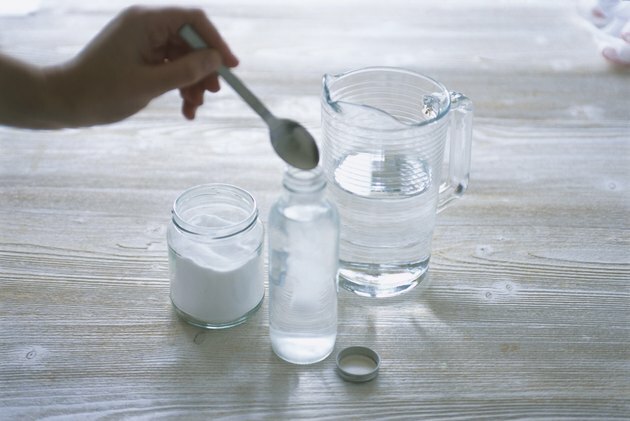 You can also make homemade laundry detergents and household cleaners, and it is used in commercial products to whiten clothes or get rid of dirt. Also, it is used to get rid of strong odors. Although those are some of the most common uses, borax is found in a ton of products that you wouldn't expect. Borax is used as an emulsifier (a product that is used to combine two or more liquids that are unmixable or unblendable), a buffering agent or a preservative in products such as moisturizers, creams, shampoos, gels, lotions, bath bombs, scrubs and bath salts. It is also used to make slime for children as well. Slime is a gooey material that many kids can either buy or create in their own home. If your children want to make borax slime in your home, this should be done under the supervision of an adult. All you need is a plastic tub or bin, a glass bowl, glue, warm water, borax and food coloring (optional). First, you're going to squeeze 4 ounces of glue into the glass bowl. Next, you're going to mix in 4 ounces of warm water. If you want to make your slime colorful, you can add food coloring. Add an appropriate amount of food coloring depending on how dark or light you want the slime to look. Then, you're going to mix 1 teaspoon of borax into a half cup of water and add this to the glue mixture slowly. Stir the solution until the slime starts to come together. Then you will knead the flubber or slime together to get your desired consistency. You'll know it's ready when the slime goes from wet and gooey to stringy and then to a consistency that is malleable and holds together. There are a ton of recipes if you want to make your own homemade borax cleaner. If you want to clean your carpet, all you have to do is add half a cup of borax per gallon of water. You can also use borax as a toilet bowl cleaner. Pour a box of sodium borate powder (borax) into your toilet bowl at the end of the night and let it soak overnight. If you need to clean mold or mildew from the shower or other surfaces, mix a cup of borax with a quart of hot water. To make the cleaning process more manageable, pour the solution into a spray bottle, spray your surface, let the solution sit for a couple of hours and then clean the surface thoroughly. The area should look as good as new. If you need to clean your floor, pour about 1/4 cup of borax and 1/2 cup of vinegar into a mop bucket. Then, fill the bucket with hot water and a dash of dish soap. If you want to create an all-purpose cleaner, fill a spray bottle with 2 tablespoons of borax and 2 cups of water. If you have an ant infestation inside or outside of your home, all you have to do is mix equal parts of borax and sugar in the area where the ants are present. This combination also works for bugs like fleas, cockroaches and other common pests. Is Borax Safe or Toxic? Borax is considered to be a natural ingredient, so on the surface, it is safe to use and not toxic. The only way that it could be considered toxic is if you inhale large amounts of the powder or if the powder is ingested. Although it is supposed to be one of the safest chemicals available on the market, you have to be careful when using borax around children. If borax gets on your skin or a child's skin, it will not cause skin irritation, but long periods of inhaling the dust from borax powder can irritate the respiratory system. If your children are using borax to make slime, make sure they are not inhaling the powder. If they are young, they need to be supervised because ingesting borax can cause nausea, vomiting and diarrhea. If you have read that borax is considered unsafe or toxic, then it is being mistaken for boric acid. Borax and boric acid are both natural pesticides, but they are not the same thing. Borax is used to create boric acid, but they are different chemicals. Boric acid is considered to be more toxic than borax and can cause more damage than borax if ingested. Although borax is considered to be a fairly "green" product, it is recommended that people don't use cosmetic products that have borax as an ingredient. To avoid inhalation of borax when cleaning, keep it away from your mouth, eyes and nose. Don't forget to use gloves when using borax around the house, and wash your hands with soap if it gets onto your skin. If you have any open wounds or cuts, always make sure that they are covered because borax is quickly absorbed into open wounds or cuts. If you're cleaning with borax, make sure to thoroughly rinse the area so there isn't any borax left on the surfaces. If you're washing your clothes with borax, make sure that they are thoroughly cleaned and rinsed before putting them into the dryer. If you don't rinse out all of the borax, you shouldn't wear the clothes. It is important to keep borax away from small children and pets. Don't leave borax in front of small children, and keep it out of their reach. If you have pets, then you should avoid using borax as a pesticide inside or outside your home. If ingested, it can seriously harm your pet.